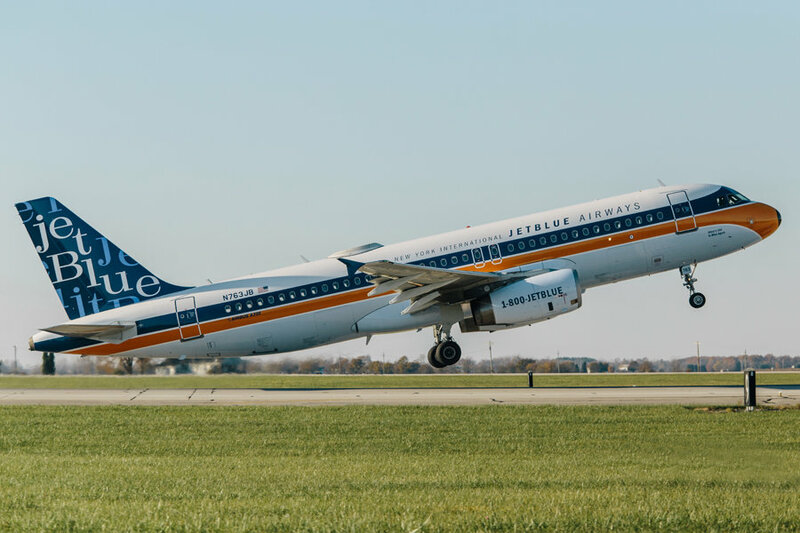 The JetBlue RetroJet boasts a one-of-a-kind paint scheme designed to celebrate the iconic jet age of air travel and to highlight JetBlue’s innovative style. To create the look, JetBlue dug into an archive of popular logos and notable companies from the mid-1960s to essentially reverse-engineer the JetBlue brand and envision what the customer-friendly carrier of today might have looked like some five decades ago. “The 1960s were rich with sleek but bold graphics and style – characteristics of today’s JetBlue brand,” said Jamie Perry, vice president marketing, JetBlue. The aircraft design features bold JetBlue orange and blue “speed stripes” down the length of the Airbus A320, a popular characteristic of 1960s aircraft paint schemes. Above the window line “JetBlue Airways” is printed in a font consistent with a typeface widely used in the time period. And because today JetBlue is New York’s Hometown Airline® serving nearly 100 destinations across the U.S., Caribbean and Latin America, the words “New York International” accompany the airline’s name. But perhaps most notable is the aircraft tail. Absent is a simple airline logo or icon. 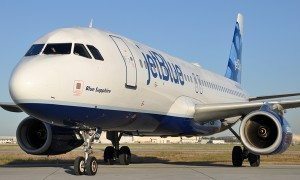 Instead, JetBlue’s RetroJet tail features three colors and a lively 1960s jazz-inspired font that would have stood out among other airlines of the time. It’s a jet age take on JetBlue’s hallmark tails of today. For inspiration, JetBlue designers spent several days at New York’s Lubalin Archive at the Cooper Union poring through original advertisements, graphics, images and fonts from the 1960s. The team looked to leading brands for guidance on common themes and design elements that were widely used and associated with 1960s style. 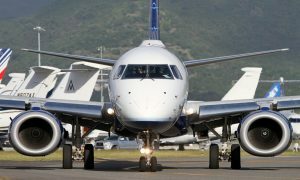 JetBlue is officially introducing the RetroJet on this season’s first roundtrip between New York’s John F. Kennedy International Airport (JFK) and Palm Springs International Airport (PSP). The Palm Springs route was selected because of the desert destination’s mid-century modern architecture and style. Greater Palm Springs is a popular destination known for blending its nostalgic past as a playground for Hollywood with hip new development attracting a new generation of trendy travelers. “Greater Palm Springs is proud to be the epicenter of the nation’s most significant collection of midcentury architecture,” said Scott White, President & CEO of the Greater Palm Springs Convention & Visitors Bureau. JetBlue customers traveling on the first flights between New York and Palm Springs will receive a 1960s-inspired amenity kit with playing cards, a luggage tag, vintage-style post cards highlighting the airline’s focus cities and a commemorative pin matching the ones worn by the onboard crew members.